The Orange Cottage is the largest of the accommodations available at Quintassential, a large two bedroom apartment cottage decorated in traditional Algarvian decor with white washed walls, which is rich in charm, style, rustic yet with modern comforts. Being part of the original farmhouse with its high sloping ceilings, this cottage is always cool in the summer and warm in the winter. This cottage is a real home from home and lacks nothing. The open plan kitchen/diner has a fully fitted modern kitchen with electric oven and vitro-ceramic hob, dishwasher, fridge/freezer, microwave, electric kettle, coffee filter machine, hand held electric blender and toaster. There are also double doors leading onto the sun terrace. There is a glass dining table comfortably seating four on luxury leather dining seats. The Lounge is tastefully decorated with a leather 3 piece suite, 36 inch widescreen TV, Satellite TV (UK free to view channels), DVD player (small selection of DVD’s available) and radio/CD player (guests to bring own CD’s), Logitech iPod speaker doc (battery operated guests to provide batteries), a selection of English reading books, puzzles, chess set, playing card, and the Orange Cottage boasts an original 19th century fireplace that now houses the wood-burning stove – wonderful for those cooler winter evenings. The Orange Cottage also provides during the winter months 24/7 heating as there are also an additional four eco wall heaters. Double doors lead onto the very large south-facing private terrace with its own table and chairs comfortably seating four people, reclining chairs and a brick built BBQ area. There is also a large covered terrace with a cane ceiling and wooden beams for al-fresco dining. Under the terrace there are further cushioned seats to relax, unwind and keep cool from the sun. Vibrant bougainvillea, Jasmin and Hibiscus drape the exterior, and there are rock gardens and pot plants sprinkled all around, with shrubs, palms, and fruit trees all producing an air of peaceful tranquility. The bathroom has a new double walk-in shower, washbasin with vanity unit under and blue marble top, WC, bidet, shaver point and a sloping wooden ceiling. The Orange Cottage bedrooms consist of one bedroom with a double bed with colour co-ordinated soft furnishing in a vibrant Mediterranean yellow and Algarvian blue and the other bedroom with twin beds has colour co-ordinated soft furnishings in calming soothing lilac. The twin bedroom is large enough to accommodate a travel cot if required. Both bedrooms are tastefully decorated to high standards, have beautiful throws and crisp bed linen to compliment the décor and have sloping wooden ceilings. Both bedrooms have free standing fans available. The Orange Cottage sleeps a maximum of 4 adults and an infant. 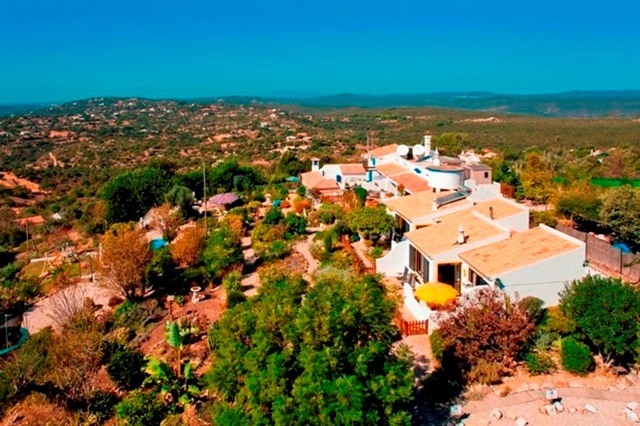 The Quintassential is an oasis of peace and tranquillity perched high on a hilltop 1200 feet above sea level totally fenced and accessed via electric gates overlooking the market town of Loule, only 10 minutes from the blue flag beaches of the Algarve and world famous golf courses and a 15 minute drive from Faro International airport. The Quintassential Self Catering / Bed and Breakfast Holiday Apartment Cottages are a small family run cluster of self catering / Bed and Breakfast holiday accommodations catering for couples, families and the over 50’s. The accommodations are fully licensed meeting to all requirements by the Portuguese rental law with the required Alojamento Local licence (AL). Loule has everything one would need from a holiday with endless restaurants, cafes, supermarkets, banks, shops, award winning traditional vegetable, fish & vegetable market, famous gypsy market, historical buildings etc. There are also two restaurants within reasonable walking distance of the Quintassential. The Quintassential is open all year round so that guests can enjoy the 3000 hours of sunshine the Algarve has to offer. We understand that with low cost airlines it may be better to travel on days other than Sunday or Thursday, so we are flexible with our arrival and departure days. Our minimum booking is for three nights. The cottages are individual at the Quintassential, originally dating back to the 19th century that was once a farmhouse and over the years has been thoughtfully converted to provide picturesque holiday accommodations. One of the accommodations is occupied by the owners who are there to help, but never infringe on your privacy. Our rustic home from home accommodations are furnished equipped and decorated to a very high standard, with great attention to detail visible in all the accommodations together with little personal touches resulting in good value for money special holiday lets and varied to suit all age groups. All the accommodations are south facing and all have sea views, have their own separate entrances, own kitchens, private south-facing sun terraces and BBQ areas. In all the accommodations there are a selection of puzzles, chess set, dominos, playing cards and a vast selection of English reading books. No group bookings are accepted to ensure that all guests have a truly relaxing and peaceful holiday. There is also free Wi-Fi Internet access available with hotspots within the Quintassential for guests staying. The Quintassential has a large heated pool area; the pool measures 10 x 5 m and sun loungers, parasols etc are provided for the use of the guests. There is also a large raised sun deck poolside to soak up the glorious sun and a freestanding hot tub spa jacuzzi for guest use, especially nice under the stars and moonlight. The pool is heated during the cooler months from 1st October until 30th November and then again from 1st March until 30th April and there is no additional charge for heating the pool. Children are welcome at the Quintassential and there is a children’s play area with swings, slide, and seesaw all alongside an orange grove. For those guests that are a little more energetic, there is also an outdoor games area with a professional size table tennis table and a 12ft trampoline. For families travelling with small children, we can provide a whole host of baby equipment free of charge, being parents ourselves, we know what it is like travelling with little ones, and our aim is make everyone’s holiday an enjoyable memorable experience, not stressful. For an additional charge we can also arrange a pre-arrival shopping service, champagne and strawberries, baby welcome hamper, baby sitting services, spa treatments, take away meal service, beach towel hire and a laundry service. Further information on our website. We can also arrange varied activities whilst holidaying at the Quintassential. We can arrange dolphin watching tours with a local nature company. Jeep safari tours can also be arranged where you are picked up at the Quintassential and enabling you explore the inland Algarve. For those who wish to walk the Algarve, we can arrange guided walks, half day, full day or even walking holiday weeks. Your guide will pick you up at the Quintassential and take you on a discovery trail. For those who like to bird watch we can also arrange bird watching tours and bird watching holiday weeks. For further information please ask. During the summer months from July to mid September, back due to popular demand, summer evening meal specials. A three-course home cooked traditional Portuguese cuisine is served for all to enjoy on the owners private terrace. A great way to relax, unwind and socialise with the other resident guests. Also available from mid September to the end of June, our weekly evening meal service, traditional home cooked Portuguese cuisine is served in your accommodation or weather dependent this can be offered of a lunch time and served on the owner’s terrace. New for 2014, The Quintassential is now pleased to offer our Bed and Breakfast option, a delicious continental breakfast basket delivered to your cottage for you to enjoy when you are ready, so relax, take your time and enjoy your breakfast. Check In/Check Out : Check in from 15.00 hours local time. Check out from 09.45 - 10.00 hours local time. Policies : 30% non refundable deposit required to secure booking, balance & returnable damages deposit due no later than six weeks prior to arrival. What to see & do : Located in the central Algarve, there is much to see and do. Located 2kms north of the market town of Loule, 17 kms from Faro airoport. Full directions provided at the time of booking confirmation. Alojamento Local License as required by Portuguese law.